UVA students "angry that the administration has failed to take action to prevent sexual assaults on campus" hold six days of protests on the Rotunda steps. Protesters are particularly unhappy that the recommendation of the women's concerns committee that a sexual assault prevention coordinator be hired has not been acted on by the administration for nearly three years. The vigil lasts 134 hours, "one for each documented sexual assault that occurred at UVA during the 1988-89 school year, when the prevention officer's position was first recommended." 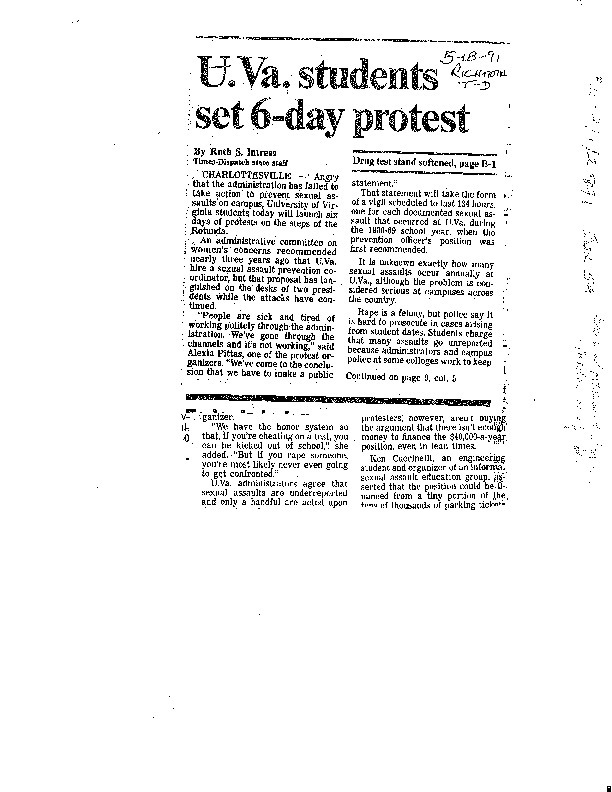 This article and one other (Suzanne Fields, ""Crying Wolf,"" also included) was apparently enclosed in a letter to UVA President John Casteen and is notable for its marginalia, which expresses strong disapproval that Casteen permitted the six-day Rotunda protest to go forward.